I’ve had a very good month. I submitted my Meerkat Montage to the David Shepherd Wildlife Artist of the Year annhual exhibition. This esteemed event attracts entries from all over the globe and a very small percentage gets accepted. Last year I got into the category “Selected but not hung” with a grazing zebra which was very nice but this year I have managed to go one better by getting into the actual exhibition. The event will be at the prestigious Mall Galleries in London from June 27th to July 2nd 2016. It’s particularly important to me because David Shepherd was my original inspiration in wildlife art, something he’s been a pioneer of since the early 1960s. I believe I have five of his books and three of his prints. We as a family have also adopted elephants and wild dogs that his wildlife foundation saves so to get into his exhibition is awesome for me. Then to cap it all off I applied to join the legendary Society of Animal Artists. This society is full of my heroes. I skimmed through the member list and saw amazing luminaries as associate members. They have a higher level called Signature level but that’s reserved for the best of the best – a bit beyond me I would have thought. So here I was waiting for my application to be judged and hoping I would get in (apparently 75 people applied this year and only 25 were accepted) when I get the email saying “Congratulations, you have been accepted as a Signature Level member”. This didn’t even enter my head that I would get this result. I have been indeed honoured this month and am very grateful. 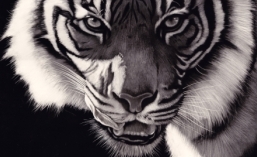 Along with being able to sign my work with the letters MSA for my Master status in The International Society of Scratchboard Artists, I can now also add the letters SSA as a signature artist of the Society of Animal Artists. Amazing. Congratulations! Like forward to seeing you in 2017. Congratulations. Your work is superb. Congratulations Patrick…you deserve this. I knew when I first met you in California you were a special person and you deserve special acknowledgements for your amazing work. Wow Patrick you certainly have had a wonderful year ,congratulations on your success, very well deserved. Your work is beautiful and continues to be an inspiration. I hope your well deserved success enables both you and your art in the longer term to put the plight of wildlife everywhere more in the publicâs face. I hope it also helps get you into the field to follow your dreams even further. With a talent and drive like yours the sky is truly the limit. You are very deserving of the honor you have earned with your beautiful work. God’s best blessings.